Looking for a special after-dinner treat you can prepare for your family this weekend? 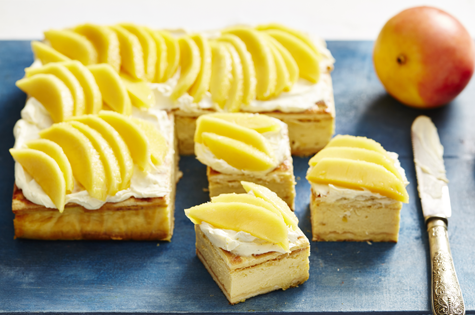 This CALYPSO® Mango Cheesecake Slice is easy to make and incredibly tasty! 1. Preheat oven to 160°C fan forced. Grease and line a 22cm (base) square cake pan with baking paper, allowing a 3cm overhang on all sides. 2. Arrange 16 biscuits, glaze side down, over the base of the cake pan, cutting to fit so the base is covered. 3. Peel and cut the fruit from 1 mango. Process the mango until smooth (you should have ¾ cup of puree). Pour the puree into a jug, wash and dry the food processor. 4. Combine the cream cheese and sugar in the processor. Process until smooth. Add the sweetened condensed milk, egg yolks and sour cream, pulse until just combined. Add 3/4 cup mango puree, pulse to combine. Pour over the base. Arrange more biscuits, glazed side up, over the top. Bake for 40-45 minutes until set. Set aside to cool. Refrigerate for 4 hours or overnight if time permits. 5. Lift the slice onto a board or serving platter. Fold the vanilla through the mascarpone. Gently whisk with a balloon whisk to thicken if necessary. Spread over the biscuits. Cut the cheeks from the remaining mangoes. Using a large spoon remove the mango fruit from the cheeks and thinly slice. Arrange over the mascarpone. Cut into squares to serve. The fruit is firmer so the fruit will slice easily, holding the shape when arranging on the cheesecake. Best of all the fruit is fibre-free so you don’t get those “bits” stuck in your teeth. Thanks for the inisthg. It brings light into the dark! Free knowledge like this doesn’t just help, it promote demacrocy. Thank you. What I find so intsteering is you could never find this anywhere else. Hey, good to find sonmoee who agrees with me. GMTA. Make breakfast special this weekend! Delicious, nutritious, and easy to make!